The Iowa City Tenants' Project is committed to tenants' rights and to fair play for both tenants and landlords. The Tenants' Project seeks to educate tenants and landlords about their legal rights and responsibilities and to empower tenants. The reality is that the law does not enforce itself, you will need to be willing to stand up for yourself in order to be treated fairly and enforce your rights. Landlords can be frustrating to deal with, but it does not help to get angry and lose your temper with them. This will definitely backfire. Just stay calm, see what the landlord says, and if you are not satisfied with the results, take them to court. In fact, staying calm, being reasonable and having a certain amount of patience while still being persistent can actually accomplish the goal you are seeking, while getting upset or berating the landlord slows or even blocks getting what you want. Be flexible! It may be that what you want is not practical or too expensive for the landlord, but they may be willing to take other measures. Make sure you have a record of all your interactions with the landlord and have evidence of the problem. If you talk with the landlord on the phone or in person, follow up the conversation with an e-mail, summarizing what was said. Make a log of events, recording what happened, the time and date, who did what, and get the names and contact information of anyone you dealt with. Also make sure you have a copy of the lease and any communications received from the landlord. If you just do one thing: TAKE LOTS OF PICTURES! Pictures are excellent evidence. Date stamped pictures are even better. Having an independent witness, not family or fellow students, who is willing to testify in court, is probably the ideal evidence, though this may not be possible depending on the situation. Without evidence, it is difficult to proceed with an informal complaint and it is almost impossible to go to court. In addition, to being essential in court, evidence can also be useful in working with a landlord. For example, while many tenants get upset about mold, only some take pictures and very few have any evidence that their specific mold is dangerous. Most tenants simply read general articles on the Internet which don't prove that their specific situation is problematic, which is what would be necessary in court. However, I've had two separate tenants with mold who were able to get good results, either repair or lease termination from their landlords. In the first situation the tenants hired an independent housing inspector with experience with mold who was able to certify that their specific situation was a health problem. In the second, the tenant got a letter from a doctor indicating that the mold in the unit, not just mold in general, was a health problem for their child. Here the tenants had specific, credible expert evidence from an independent source, evidence that would have gone a long way to proving their case in court. But with this level of evidence court turned out not to be necessary as the tenants calmly and reasonably presented the evidence to their landlords and got a good results without suing. Completely clean up your house or apartment. This means taking out all of your stuff, removing all trash and really getting the place clean. Key areas are the top of the stove and inside the oven, inside the refrigerator, sinks and the bathroom. Take lots of pictures!!!! This is probably the most important step. Once you've finished your cleaning, take lots of pictures so you have evidence that you actually cleaned the place up. Get an outside witness who lives in or near Iowa City. Don't get a fellow student, relative (sorry Mom!) or close friend. Ideally they are over 30, what you are looking for is someone who will make a good witness in court. Once you've cleaned the place up, have your outside witness come in and look carefully at the place. Make sure the landlord has your forwarding address. They can keep your deposit if you don't provide them with a working forwarding address. Make sure you can promptly receive all mail sent to this address. Unfortunately, even if you clean your place up and have evidence, an unscrupulous landlord may take some or all of your deposit and even charge you extra on top. If you want your deposit back you have to be ready to go to small claims court. The Iowa Uniform Residential Landlord Tenant Act ("IURLTA") Iowa Code Chapter 562A, does not specifically regulate who is responsible for pest control and extermination. If there is a clear cause of the infestation, then whoever caused it can be held responsible, but only rarely will it be obvious what the cause is. That doesn't stop both landlords and tenants from instantly blaming the other side and insisting that they instantly take 100% responsibility and the full cost of extermination and prevention. This approach will almost surely backfire. Pest infestation is a mutual problem for both landlords and tenants and both sides need to work together to effectively solve it. Pest infestation and extermination is regulated by local governments. Here are the pest infestation and extermination regulations for Iowa City, Coralville, Cedar Rapids and unincorporated areas of Johnson County, Iowa. C. Extermination Of Pests: Every occupant of a single-family dwelling shall be responsible for the extermination of any insects, rodents or other pests therein or on the premises; every occupant of a dwelling containing more than one dwelling unit or rooming unit shall be responsible for such extermination within the unit occupied whenever said unit is the only one infested. Notwithstanding the foregoing provisions of this subsection, whenever infestation is caused by failure of the owner to maintain a dwelling in a reasonably rodentproof or reasonably insectproof condition, extermination shall be the responsibility of the owner. 145.08 PEST AND RODENT CONTROL. 1. Every occupant of a dwelling shall dispose of or store all refuse and rubbish and any other organic substance which might provide food for insects or rodents in a clean, sanitary and safe manner. Acceptable refuse containers shall be used for storage pending collection. 2. Every occupant of a dwelling or dwelling unit shall be responsible for the extermination of insects or rodents on the premises. Notwithstanding the foregoing provision of this subsection, whenever infestation is caused by failure of the owner to maintain a dwelling in a reasonably rodent-proof or insect-proof condition, extermination shall be the responsibility of the owner. 3. No occupant of a dwelling shall accumulate rubbish, boxes, lumber, scrap metal or any other materials in such a manner that may provide for rodent harborage in or about such dwelling or dwelling unit. 4. No owner of a dwelling shall accumulate or permit the accumulation of eatables, rubbish, boxes, lumber, scrap metal or any other materials in such a manner that may provide for rodent harborage in or about the shared or public areas of such dwelling or its premises. 8:6.13 Responsibilities of Owners Relating to the Maintenance and Occupancy of Rental Premises. P. Pest Extermination. Whenever infestation exists in two (2) or more rental dwelling units or rental rooming units of any rental dwelling or in the shared or public parts of any rental dwelling containing two (2) or more rental dwelling units or more than one rental rooming unit, the extermination thereof shall be the responsibility of the owner. 8:6.14 Responsibilities Of Occupants Relating To The Maintenance And Occupancy Of Rental Premises. C. Extermination Of Pests. Every occupant of a single-family rental dwelling shall be responsible for the extermination of any insects, rodents or other pests therein or on the rental premises; every occupant of a rental dwelling containing more than one rental dwelling unit or rental rooming unit shall be responsible for such extermination within the unit occupied whenever said rental unit is the only one infested. Notwithstanding the foregoing provisions of this subsection, whenever infestation is caused by failure of the owner to maintain a rental dwelling in a reasonably rodent proof or reasonably insect proof condition, extermination shall be the responsibility of the owner. 29.28 Section 309.1 Infestation. All structures shall be kept free from insect and rodent infestation. All structures in which insects or rodents are found shall be promptly exterminated by a process that will not be injurious to human health. If after re-inspection it is the opinion of the code official that adequate extermination measures have not been taken, then an approved plan of action shall be provided to the code official within 5 business days. An approved plan of action must include an approved certified pest control agency for extermination. After pest elimination, proper precautions shall be taken to prevent re-infestation. 309.2 Owner. The owner of any structure shall be responsible for pest elimination within the structure prior to renting or leasing the structure. 309.3 Single occupant. The occupant of a one-family dwelling or of a single-tenant nonresidential structure shall be responsible for pest elimination on the premises. 309.4 Multiple occupancy. The owner of a structure containing two or more dwelling units, a multiple occupancy, a rooming house or a nonresidential structure shall be responsible for pest elimination in the public or shared areas of the structure and exterior property. If infestation is caused by failure of an occupant to prevent such infestation in the area occupied, the occupant and owner shall be responsible for pest elimination. 309.5 Occupant. The occupant of any structure shall be responsible for the continued rodent and pest-free condition of the structure. Exception: Where the infestations are caused by defects in the structure, the owner shall be responsible for pest elimination. Here is a summary of a variety of different legal issues that often arise for landlords and tenants. Please keep in mind that this is a general overview and that the law may apply differently in your specific case. In addition, it is hard to predict how a case may come out in court. Nevertheless, we are lucky to now have a great deal more guidance on landlord tenant issues due to the Iowa Supreme Court's decisions in DeStefano v. Apts. Downtown 879 N.W.2d 155 (Iowa 2016) and Caruso v. Apts. Downtown. 880 N.W.2d 465 (Iowa 2016) as well as Kline v. Southgate No. 15-1350 (Iowa 2017) and Walton v. Gaffey, No. 15-1348 (Iowa 2017). Here is a detailed discussion of the legal issues in the DeStefano & Caruso brief and here is brief that explains Kline and Walton. The Iowa Supreme Court in DeStefano v. Apts. Downtown 879 N.W.2d 155 (Iowa 2016) explained what tenants can and cannot be charged for carpet cleaning. Previous to De Stefano many Iowa landlords automatically charged tenants' security deposits for professional carpet cleaning, either at the end of the lease or the end of the tenancy. In De Stefano the Supreme Court held that landlords must first inspect the carpet and only if the dirt or damage exceeds normal wear and tear can they charge the security deposit. Some tenants have had the mistaken impression that landlords can not charge for excessive wear and tear, dirt or damage to the carpet. This is incorrect. The security deposit may charged if there is more dirt or damage than would be produced by ordinary wear and tear. In addition, in DeStefano v. Apts. Downtown 879 N.W.2d 155 (Iowa 2016) the Iowa Supreme Court made it clear that the landlord may not charge tenants for repairs or maintenance that the landlord is responsible for. On the other hand, if the tenant or their guests cause damage then the tenant can be charged for the cost of the damage. Also, it is legal in a single family house or duplex for the lease to provide that the tenant will be responsible for lawn care and snow removal. Comply with all obligations primarily imposed upon tenants by applicable provisions of building and housing codes materially affecting health and safety. Keep that part of the premises that the tenant occupies and uses as clean and safe as the condition of the premises permit. Dispose from the tenant�s dwelling unit all ashes, rubbish, garbage, and other waste in a clean and safe manner. Use in a reasonable manner all electrical, plumbing, sanitary, heating, ventilating, air-conditioning and other facilities and appliances including elevators in the premises. Not deliberately or negligently destroy, deface, damage, impair or remove a part of the premises or knowingly permit a person to do so. Act in a manner that will not disturb a neighbor�s peaceful enjoyment of the premises. Tenants also need to stay aware of the state of the unit and report any damage or problems promptly to the landlord. Tenants also need to cooperate with the landlord so that repairs and maintenance can be made. One of the most difficult issues with regard to repair and maintenance is how much time a landlord has to fix a problem. It is not fair to expect instant repairs, but on the other hand, sometimes landlords take a very long time to fix problems. Repairs should be made in a reasonable time, which, of course, depends on the situation. Tenants can get the best results by being calm, reasonable, but persistent in their communications with their landlord. 3. 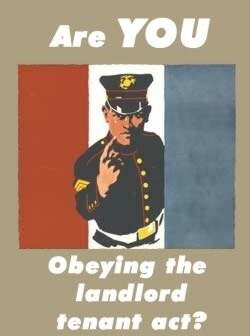 The landlord shall not abuse the right of access or use it to harass the tenant. Except in case of emergency or if it is impracticable to do so, the landlord shall give the tenant at least twenty-four hours� notice of the landlord�s intent to enter and enter only at reasonable times. Unfortunately, section 562A.19 is somewhat unclear. Subsction 1 says that the tenant will not unreasonably withhold consent, but then subsection 3 says the landlord will give 24 hours notice, which seems to imply that the landlord can come in without the tenants' consent so long as notice is given. Once again this is an ares where landlords and tenants need to work together and be reasonable. For example, I can understand how a tenant would not want anyone in their home if they are not present. However, if you are going to take this attitude you need to be very flexible about making appointments when the landlord needs to enter the premises and you need to be there when the landlord or their employees or contractors show up. It's not fair to refuse entry when you aren't present and then never be available. Landlords should also recognize how touchy this issue is and think about how they would feel if strangers showed up unannounced and barged into their home. Everyone needs to stay calm and do their best to work through these situations, recognizing that both sides have rights that need to be taken into consideration. As a practical matter there is very little that can be done if either landlords or tenants violate the access rules. While the IURLTA provides for the possibility of injunctive relief, this cannot be done in small claims court, but requires a full district court case. In addition, with access problems you are likely to have a "he said, she said" situation making it hard to prove violations or enforce the IURLTA. This is simply an inherently difficult situation because it requires both sides to be reasonable to work. One of the major protections for landlords under the IURLTA is the security deposit. As the Supreme Court held in DeStefano v. Apts. Downtown 879 N.W.2d 155 (Iowa 2016) the security deposit exists for the limited purpose of compensating the landlord for damage, either unpaid rent or other charges due under the lease or for damage to the unit that exceeds normal wear and tear. Security deposits are regulated by Iowa Code section 562A.12 of the Iowa Uniform Residential Landlord Tenant Act ("IURLTA") Iowa Code 562A. Within 30 days after the termination of the tenancy the landlord is required to either return the security deposit or send the tenant a security deposit withholding statement indicating the amount and reason for security deposit charges. Tenants should be very careful to provide the landlords with a usable mailing address because otherwise there is no way to receive their deposit or withholding statement. Section 562A.12(4) appears to provide that the security deposit is forfeited if the landlord does not return the deposit or send the withholding statement within 30 days. First, being a day or two late is probably not enough to trigger forfeiture. But more importantly in a case called HL Apartments v. Al-Qawiyy, 440 N.W.2d 371 (Iowa 1989), the Iowa Supreme Court basically gutted the forfeiture provision of 562A.12(4). If a landlord deducts for damages, but fails to send the deposit withholding statement, the only way the tenant raise the issue of forfetiture and get the money back is file a small claims case. Once the small claims is filed, while the landlord may forfeit the deposit under 562A.12(4) the Supreme Court in HL Apartments held that the landlord can make an independent claim for the damages and thus keep the money they deducted, if the damages are otherwise legal. Section 562A.12(7) provides that if a landlord withholds a security deposit in bad faith that they can be subject to up to two months' punitive damages. The Supreme Court in DeStefano v. Apts. Downtown 879 N.W.2d 155 (Iowa 2016) held that bad faith required proof of actual dishonesty on the part of the landlord. The tenant needs to prove that the landlord intentionally acted dishonestly and that the wrongful withholding was not merely a mistake or a good faith disagreement about what to withhold. This means, for example, if the landlord knew the premises were clean, but charged for cleaning or knew that the premises were undamaged and charged for damage that they were acting dishonestly and could be subject to punitive damages. See, e.g. Ikari v. Mason Properties, 731 N.E.2d 975 (Ill.App. 2000). In De Stefano the Supreme Court held that security deposits were not to be used for any charge automatically due under the lease. This means that it is not possible to have "non-refundable deposits" Anything labelled a deposit must be used only for compensating the landlord for damages permitted under section 562A.12 and if there are no damages the deposit must be refunded. The short answer to this question is "no". Once you sign a lease you are bound by it, just as the landlord is. Think of the opposite situation, how would you feel if the landlord two months in the lease came to you and said, "oh, I found someone who can pay more rent for your unit, you have to move out." Iowa Uniform Residential Landlord Tenant Act ("IURLTA") Iowa Code 562A does have provisions that allow the landlord or tenant to terminate the lease, but these are only for situations where there is a significant violation of the lease or the IURLTA. If your starting point is breaking the lease and then you start looking for provisions to do so this is not what the IURLTA is designed to do, as opposed to being worried about the underlying problem first, trying to fix it and then, as a last resort, having to move out because the problem was so severe. On the other hand, tenants can have legitimate problems like losing their job and having to move, being transferred by their employer or having a severe illness. The first thing to do try to find a new tenant to sublease. Also in these sorts of situations, I have been hired as a private attorney and have often been able to negotiate a buy-out and lease termination for the tenant. As usual in a settlement this typically involves both sides giving something up, in this situation, the tenant ends up paying and the landlord foregoes rent that they are entitled to. If you abandon your tenancy, then the landlord is required to make reasonable efforts to re-rent the unit at a fair rent under Iowa Code section 562A.29(3). Note that the landlord is not required to actually find a new tenant, just to make reasonable efforts. If the tenancy is abandoned, the tenant is liable for damages in the amount of unpaid rent minus the rent paid by a new tenant for the remainder of the original tenancy, plus other damages caused by the abandonment. One problematic issue for tenants (and landlords!) is joint and several liability. Most leases provide that all co-tenants have joint and several liability for all the obligations of the lease. Joint liability means that they have liability together, while several liability means they have individual liability. What this means is that if the total rent is $1000 per month and there are 4 tenants. Even if they pay $250 each, each tenant has agreed to pay the full $1000 themselves, if one or all of the others don't pay. So in this situation if tenant A fails to pay their normal $250 share, tenants B,C & D have to make up the difference. If tenants A, B & C move out and refuse to pay rent, D is liable for the whole $1000 and can be evicted if he doesn't pay. Now in this situation if D paid all the rent he could sue A, B & C for their share. Because most Iowa City and many Iowa leases provide for joint and several liability, tenants must be very careful about who they agree to have as roommates and co-tenants. Typical situations in Iowa City where joint and several liability becomes a factor are when there are personality conflicts between roommates that get so bad that one roommate moves out and refuses to pay rent. In this situation the remaining roommmates have to either get a new tenant, pay the shortfall or risk being evicted. If they pay the shortfall they have the right to recover it from the defaulting roommate. Another problem is a roommate who is dealing drugs or assaulting other roommates. This is a tricky situation because even if the roommate is evicted in this situation, the tenants are potentially liable for the rent shortfall. It is possible that joint and several liability could be found to be unconscionable under 562A.7 in this situation, but I am not aware of any cases directly on point. Any time that roommates move out or stop paying rent presents problems for the other roommates due to joint and several liability. This is a situation that calls for flexibility and a willingness to work together for both tenants and the landlord. The best solution for everyone is to get a new tenant, typically through a sublease. Without a new tenant, if the rent is unpaid, the remaining tenants may be evicted. Throughout Iowa with commercial landlords, it is typical to have a written lease for a year. In Iowa City year leases follow the University of Iowa schedule and run from August 1st to July 31st (or earlier in July to allow for cleaning and renovation). The other standard type of lease is a month to month lease which is often oral. Often people with oral month to month leases think that they do not have a lease because it is not in writing. If you are paying rent, you have a lease and are governed by the Iowa Uniform Residential Landlord Tenant Act ("IURLTA") Iowa Code 562A. Absent a specific agreement by the landlord and tenant, the default is a month to month tenancy under 562A.9(3) In a month to month tenancy, rent is payable each month and the tenancy lasts a month. So if you pay rent monthly, absent some other agreement, you have a month to month lease. Either the landlord or the tenant can terminate a month to month tenancy on 30 days written notice under section 562A.34(2). A month to month lease is advantageous because if your situation changes you can give 30 days notice and terminate the lease. You are only obligating yourself to payment of one month's rent and if you are evicted, you only owe one month's future rent (plus any unpaid back rent). On the other hand, if the landlord wants to terminate your tenancy they only have to give 30 days notice and they can raise the rent on 30 days notice as well under 562A.13(5). A year lease on the other hand obligates both the landlord and tenant for a year. As I discuss further in Can I Break My Lease? normally a tenant or landlord cannot unilaterally terminate a year lease without a major breach of the lease or the IURLTA by the other party. Since section 562A.34(3) states that a lease with a term longer than a month, i.e. a year lease, can be terminated on notice at least 30 days prior to the end of the tenancy, my view would be that this overrides any requirement that tenants give more than 30 days notice to stop a lease from automatically renewing. If you holdover after the end of the year lease with the landlord's consent, then the lease becomes a month to month lease under 562A.34(4). The main advantage of a year lease is that the rent and the tenancy itself are set for a year. But this is also the major disadvantage since you are taking on a very significant financial obligation. If you are evicted or get sick or have a job transfer you still owe the rent for the whole year, unless a new tenant is found. Many Iowa City landlords insist on year leases because they want to lock the tenant in to paying rent for a whole year and prefer the stability of year leases. One option would be to try to negotiate higher rent per month in return for the flexibility of a month to month lease, with the recognition, however, that the landlord has the same ability to terminate on 30 days notice. While landlords often insist on year leases many tenants cannot live in their units for a whole year. Students are often gone in the summer and people have significant life changes that are beyond their control like serious illness or a job transfer. In these situations while the tenants are obligated to the whole year's lease, they need to find a new tenant to take over the unit. Most landlords insist that if the original tenant finds a new tenant to take over that the original tenant stays liable on the lease. This is generally known as a sublease, but is technically a lease assignment because the new tenant makes an agreement directly with the landlord and pays them directly. Under DeStefano v. Apts. Downtown 879 N.W.2d 155 (Iowa 2016) if a lease permits subleasing or assignment the landlord may not unreasonably refuse to sublease or assign the lease. From the tenant's standpoint it would be much better to negotiate with the landlord and possibly even pay extra to terminate the original lease and for the landlord to sign a new lease with the new tenant. While landlords often prefer to keep the original tenant liable it can be difficult to collect from the original tenant for damages caused by the new tenant. Termination is fairer and less hassle than a sublease or assignment, but all of these arrangements are generally legal in Iowa. Landlords typically charged a set fee for subleasing or assignment, not to guarantee that they find a new tenant or to release the original tenant, but just for the processing and paperwork. While the lower courts had thrown out set fees on appeal in Kline v. Southgate No. 15-1350 (Iowa 2017) , the Iowa Supreme Court upheld the use of set fees and charges, known as liquidated damages, in residential leases, so long as the fees and charges were not unconscionable or penalties. While each charge needs to be examined on a case by case basis, in Iowa City around $100 for subleasing is probably not going to be found to be unconscionable or a penalty.